Comes brand new / factory sealed in box with styrofoam and upc. 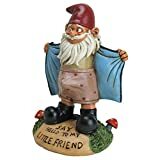 The Perverted Garden Gnome represents that sketchy man in every neighborhood.He takes one too many walks around the block and wears trench coats during the summer. That's exactly who the perverted gnome is, except our little buddy has a red hat, bathrobe, and boxers with a large bulge.